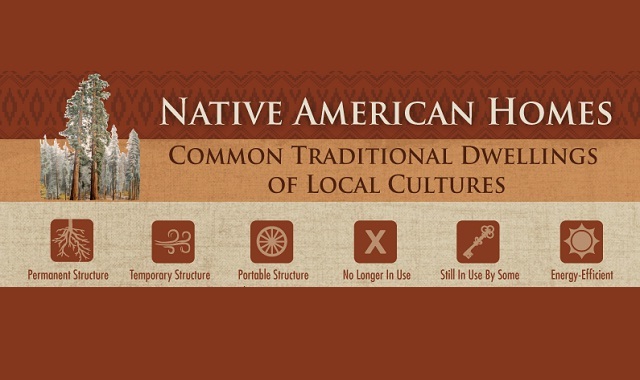 Native American Homes: Common Traditional Dwellings of Local Cultures #infographic ~ Visualistan '+g+"
Not all Native Americans live in teepees. In fact, most don’t. Even hundreds of years ago, most Native American houses were likely wigwams, but trying to name one specific type of house to be representative of the many tribes is misleading. What is a wigwam? It’s another type of shelter commonly found in the pre-colonial U.S. (before Europeans came and mistakenly called locals “Indian”). Traditional dwellings like these were made of wood, saplings, and brush. Besides wigwams, there was the longhouse, tipi, igloo, Pueblo adobe home, or grass house. Native American homes were of many shapes and sizes and built for maximum efficiency, suited to the specific landscape the tribe occupied. Some were built for being on the go, while others like the plank houses resembled some of our study wooden sheds. We’ve listed facts about the brilliant design of Native American dwellings in several parts of North America. Check out the diversity of these different homes!